Looking for the best Oakham carpet cleaner? One question people want to know is how soon will my carpets be dry and back in use. Well by using The Rutland Cleaning Company the answer is before any of our competitors. How can we be so confident? Drying times are based on a number of factors, some of which such as outside weather are out of our control. Others we can control however such as cleaning techniques, cleaning chemicals and the equipment being used. It is the latter area that we have invested in a machine that far out performs anything our competitors have or indeed anything we previously used. This petrol powered machine is twice as powerful as any electric portable machines that others use. Twice as much suction for dryer carpets. Twice as much pressure for deep down cleaning. Endless steaming hot water for the best cleaning available – as we all know hot water cleans far better than cold. How long to be dry ? Using a portable like the other companies manmade fibres should be dry in 2-3 hours with wool taking longer as it absorbs more moisture – say 4-5 hours. 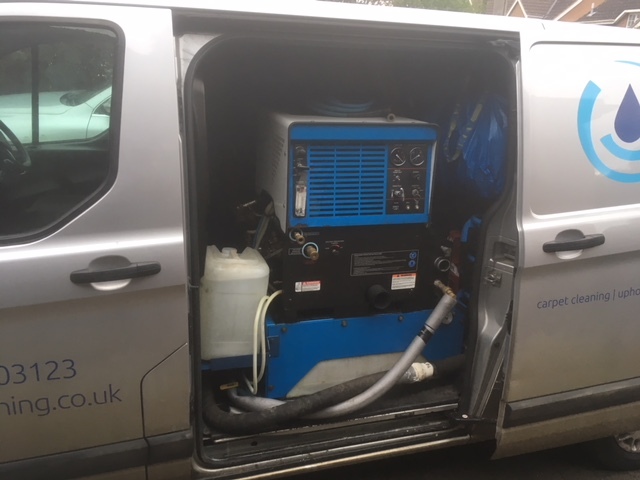 With our new high power machine you can halve those times, indeed on many occasions the carpets are dry before we leave your home – letting you get back to normal more quickly. Now you can see why we are confident that we are the best local Oakham carpet cleaner for you and your home.